The last few posts that I’ve written regarding the #HealthiestYouEver Culturelle Community have really focused on learning better habits around what goes inside our bodies. If I’m being honest with you, I NEED ALL OF THAT INFO. While I make good decisions on the surface for myself and my family, it’s always good to keep further researching ways to live the healthiest version of myself. As you know, Culturelle’s #HealthiestYouEver Community is set up in a way that enables the member to have fun while learning. We take quizzes, watch videos and check out infographics, all while leveling up! As a gamer, you know I’m completely interested in this! 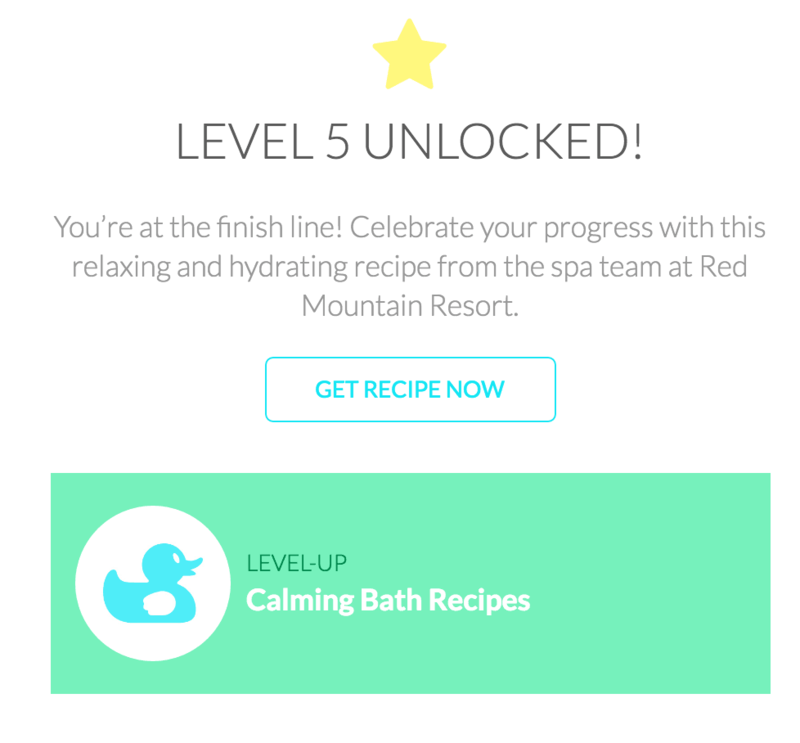 When you level up, you earn prizes like free coupons, free downloads and recipe ideas. How fab! Today, I decided it was time to complete Level 4 and was so excited to see a shift in gears on the web. Instead of focusing on food consumption, we instead learned about what we could do for peace of mind. Life is all about balance. It’s about our minds, bodies, and souls. And BOY was level four a great reminder for me to slow down and give myself permission to take care of myself. 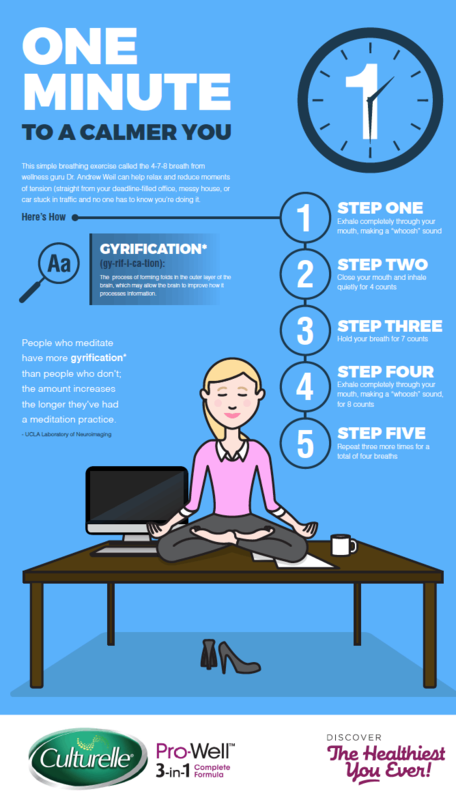 The quizzes and videos focused on deskside yoga – something I NEVER thought I would do. It made me look deep into myself and see just how calm I really am and then taught me techniques to ease my mind. Action, people! Results! 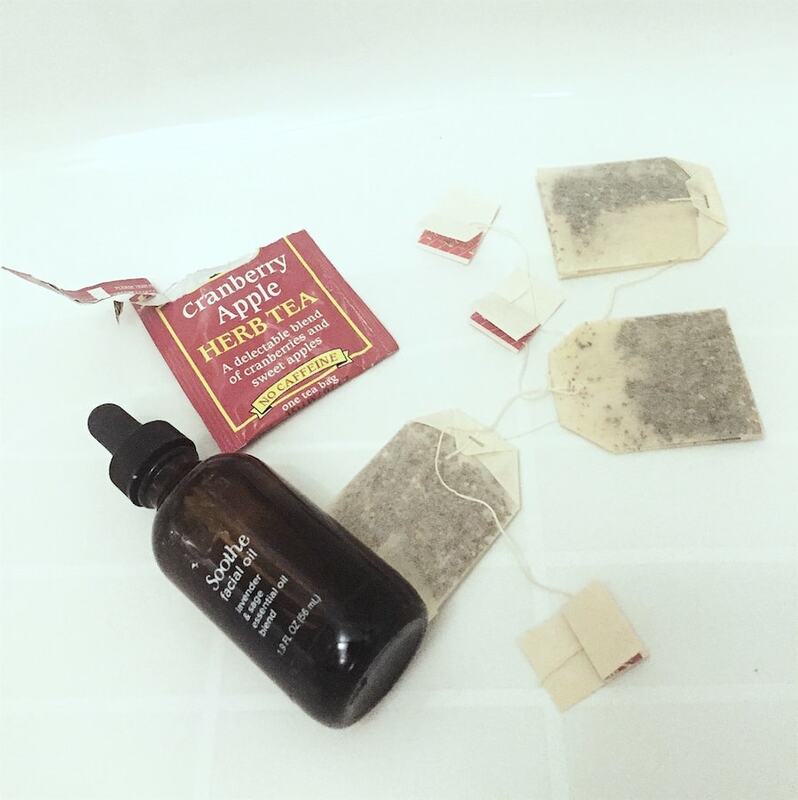 And then – my greatest takeaway from Level 4 – the great reminder that there is a true benefit to unwinding with a good bath! You don’t have to go to a spa to find deep relaxation. You can find a sense of calm from the comforts of your own home. Whether you use essential oils or fill your house with aromatic smells thanks to herbs and teas, your skin and your mind will thank you. I was given a few recipe suggestions as my prize for concluding Level 4. WOOT! Thankfully, I had some apple cranberry herbal tea AND some lavender and sage essential oils already in the house ready to go! What luck…and what a great bath. The water is flowing right now and these babies were ready to take me away to that peaceful place! Woo hoo!! As you navigate through the #HealthiestYouEver Culturelle Community, you will learn to Go With Your Gut, Strengthen Your Heart, Bolster Your Immunity, Ignite Your Spirit, and Make The Connection. I can’t WAIT to see what Level 5 has in store for me! For more information about Culturelle, click here or check them out on Twitter and Facebook. Be sure to check out the Culturelle Pro-Well #HealthiestYouEver community!! For every step you complete, you’ll earn another entry into the grand prize drawing for a chance to win a Spa Retreat at Red Mountain Resort! 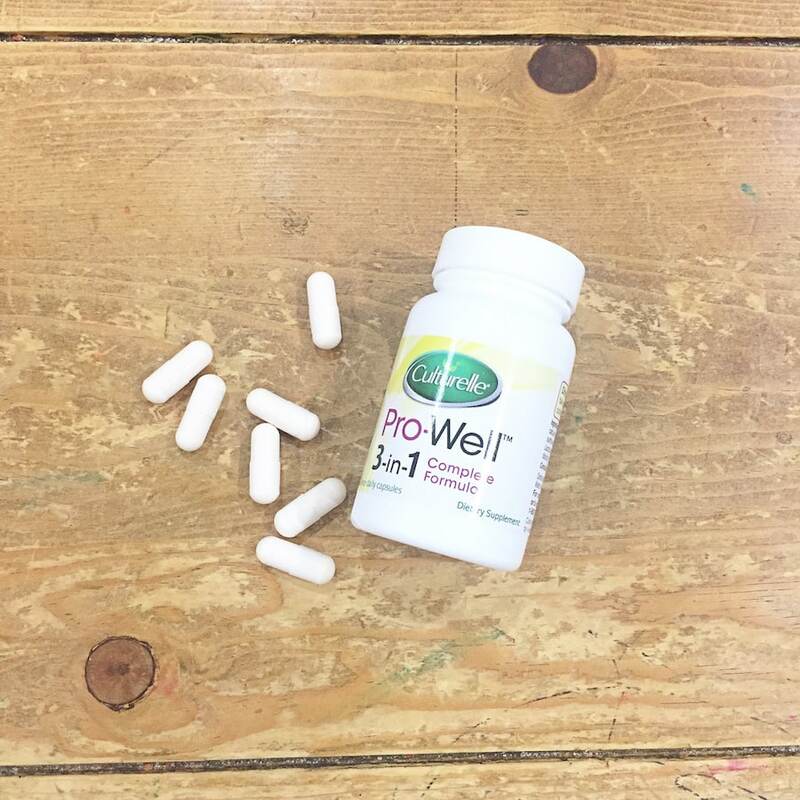 Although I have been compensated by i-Health, Inc., the makers of Culturelle® Pro-Well™ 3-in-1, the opinions expressed in this blog are independent and not associated with i-Health. That bath sounds heavenly. That also looks like a great probiotic! I don’t really take baths, I most shower everyday but the tea soak sounds relaxing. Bubble baths are my favorite! I had a nice long one on my birthday this week! I just tried the 1 minute to a calmer you. I think I need to take a minute for myself every hour, what a relaxing technique. And baths yes, I need more of those. This is awesome! Baths definitely are SO relaxing. I love your 1 minute trick also! 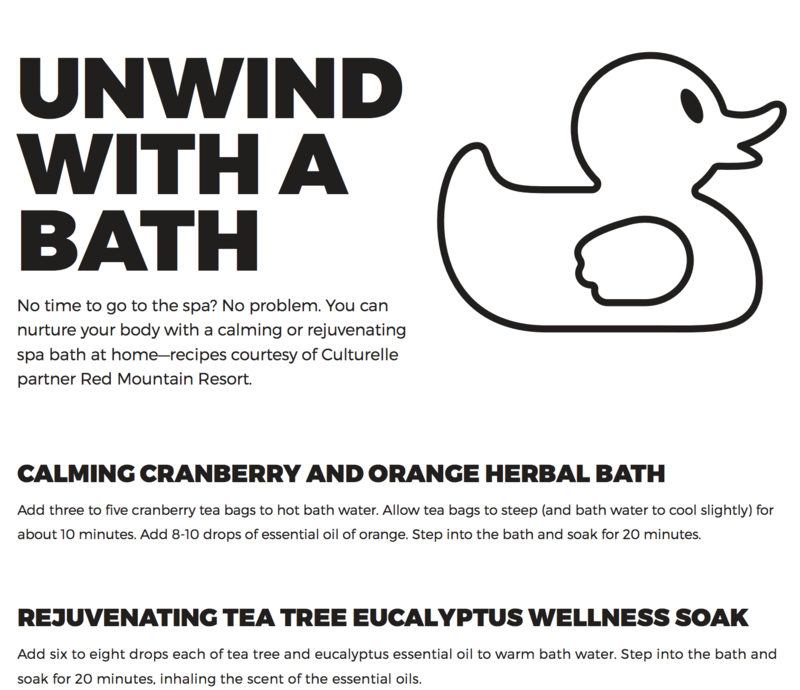 The calming cranberry and orange herbal bath definitely sounds so relaxing. Same with the tea tree eucalyptus wellness soak. Can’t wait to try both. What a fun community! Having three littles ages 6 and under comes with overwhelming amounts of stress. Thanks for the tips! I’ll be implementing them!